53 miles south of San José in the unique and diverse San Gerardo de Dota Valley, just 5 miles from Los Quetzales National Park, Miriam's Quetzals is the best spot to find the -so called- most beautiful bird on the planet: the Resplendent Quetzal - between the months of October and January... up close and personal like nowhere else! Miriam's Quetzals is located in the beautiful San Gerardo de Dota Valley, famous for its rare and gorgeous Resplendent Quetzals and friendly community. The climate is refreshing, often referred to as "eternal spring". The views of the valley from our balcony are spectacular. San Gerardo de Dota is an ideal destination for relaxing and enjoying the wonders of the cloud forest. With so many birds in our feeders and gardens, a visit of at least two nights or more is recommended. 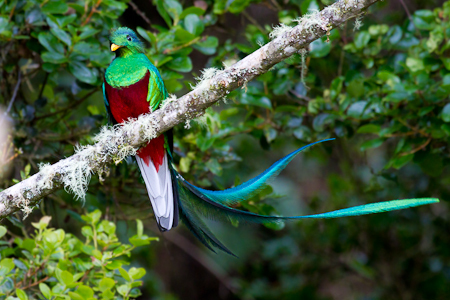 The Quetzal is considered by many as the most beautiful bird of the world,This fantastic jewel of nature is nesting in the nearby forest and can be seen all year round, nevertheless they are more abundant during the months of October to January. Many species such as hummingbirds, tanagers and woodpeckers, are seeing up close and personal on our feeders and gardens, making this Miriam's Quetzals a true Birdwatching Paradise and a Photographer's Heaven!.